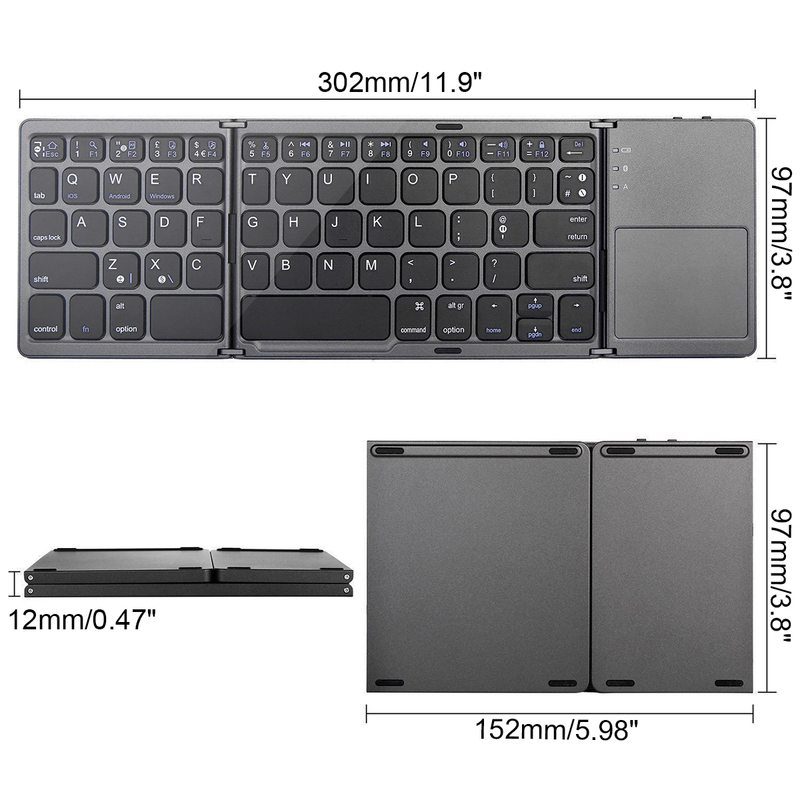 Folding and ergonomic bluetooth keyboard, Pocket size, sleek and slim design. It's a perfect gift for anyone who often travel or on a business trip. It allows you to operate your mobile devices on the go. 1. ERGONOMICALLY DESIGNED, UNIQUE HOT KEY DESIGN, USE MORE FREELY. 2. FULL FUNCTION, WEIGHT-LIGHT, EASY TO CARRY. 3. SUPER GOOD USE FEELING, SUPER GOOD SHAPE DESIGN. 4. THE BIGGER TOUCH BOARD, THE UNIQUE DOUBLE MOUSE BUTTON. 5. THE INNOVATIVE SMART - TO - CODE TECHNOLOGY DOES NOT TAKE THE RECEIVER LOST. 6. THE USE OF ENVIRONMENTAL PROTECTION MATERIALS, THE WHOLE PROCESS LEAD-FREE PROCESS, IN LINE WITH THE ROHS STANDARD. 7. 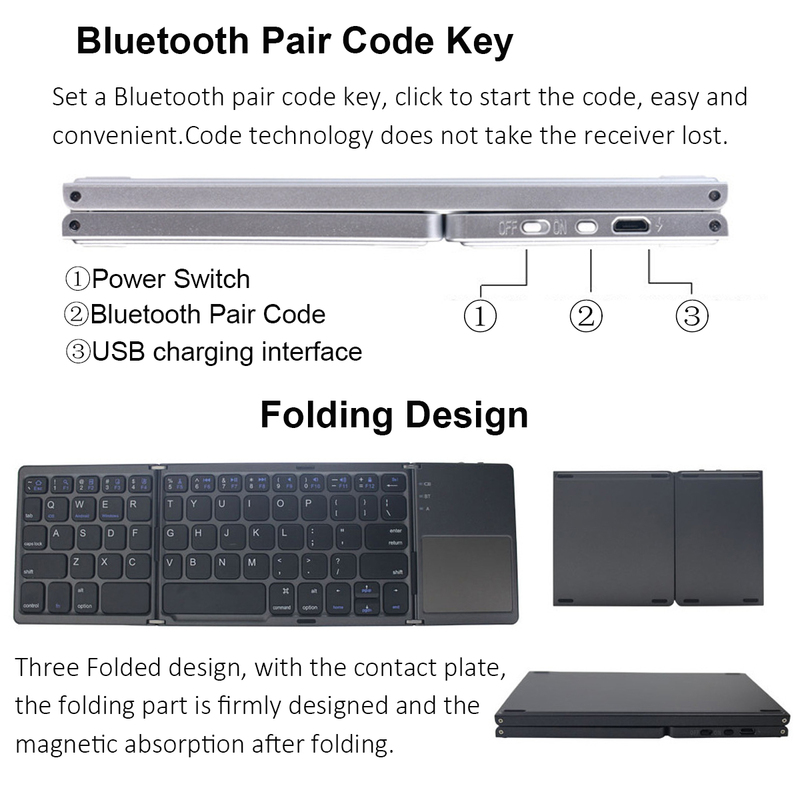 THREE FOLDED DESIGN, WITH THE CONTACT PLATE, THE FOLDING PART IS FIRMLY DESIGNED AND THE MAGNETIC ABSORPTION AFTER FOLDING. BLUE LIGHT WILL TWINKLE AND INTO THE MATCH MODE QUICKLY. 2. 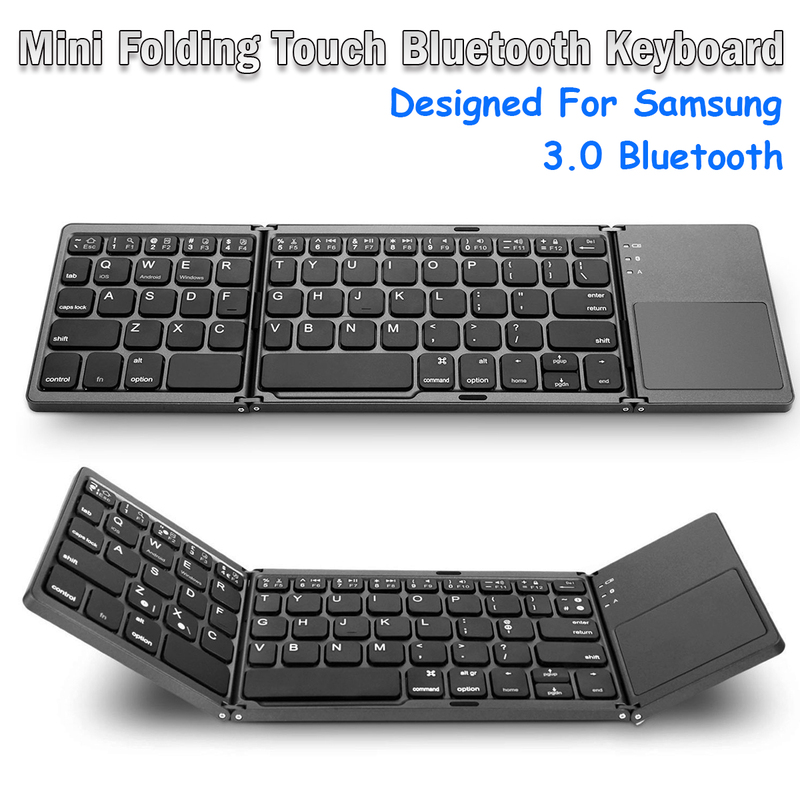 OPEN THE TABLET PC SETTING "BLUETOOTH" INTO SEARCHING AND PAIRING STATE. 3. 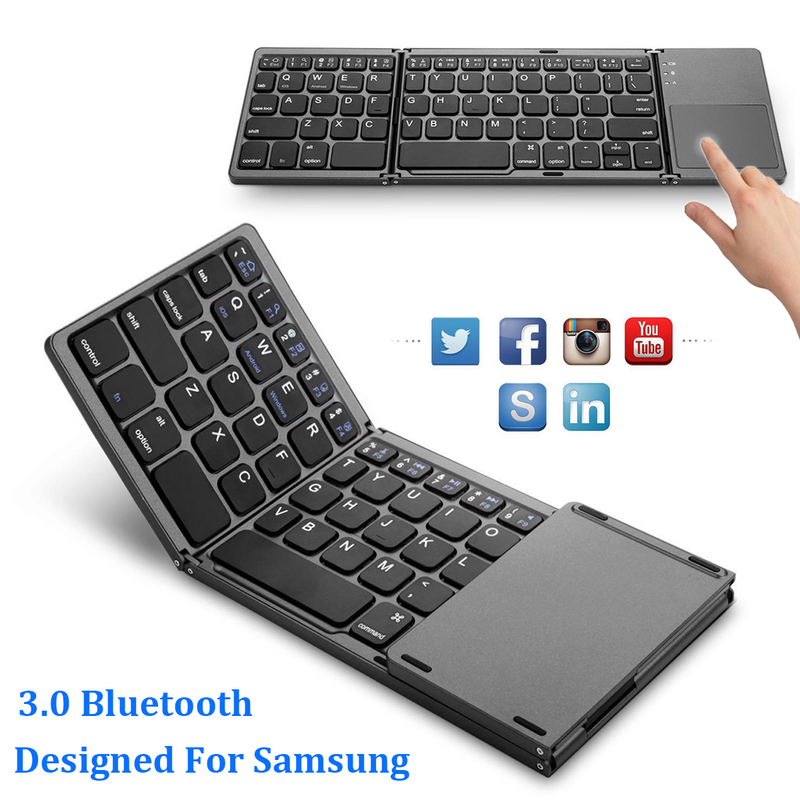 YOU WILL FIND THE “BLUETOOTH 3.0 KEYBOARD" AND CLICK TO NEXT STEP. 5. 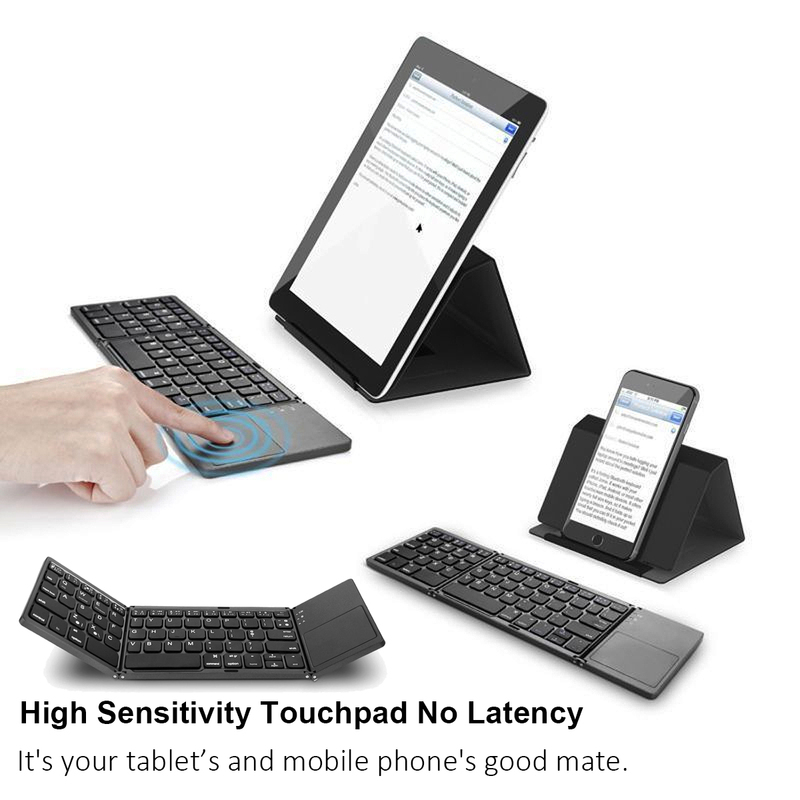 THERE HAVE A TIP FOR CONNECTING SUCCESSFULLY, YOU CAN USE YOUR KEYBOARD COMFORTABLY. POWER SWITCH AND THE TABLET PC "BLUETOOTH. "THE BT KEYBOARD WILL SEARCH THE DEVICE AND AUTOMATIC CONNECTS.